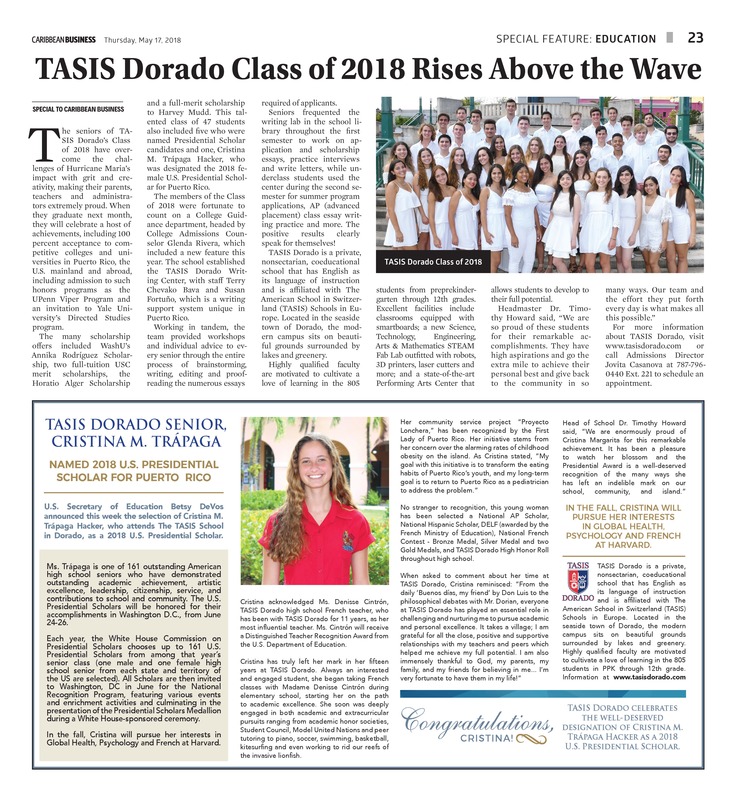 The TASIS Dorado Class of 2018 overcame the challenges of a senior year impacted by Hurricane María with grit and creativity, and they have made their parents, teachers and administrators extremely proud. When they graduate next month, they will celebrate a host of achievements including 100% acceptance to competitive colleges and universities in Puerto Rico, the mainland and abroad, including admission to honors programs such as the UPenn Viper Program and an invitation to Yale University's Directed Studies program. The many scholarships offer included the WashU Annika Rodríguez Scholarship, two USC full-tuition merit scholarships, the Horatio Alger Scholarship and a full merit scholarship to Harvey Mudd. This talented class of 47 also had five students named as Presidential Scholar candidates and one, Cristina M. Trápaga Hacker, was designated the 2018 female Presidential Scholar for Puerto Rico. The members of the Class of 2018 were fortunate to count on a College Guidance department, headed by College Admissions Counselor Glenda Rivera, that included a new feature this year. The school established the TASIS Dorado Writing Center, with staff Terry Chevako Bava and Susan Fortuño, a writing support system unique in Puerto Rico. Working in tandem, the team gave workshops and individual advice to every senior through the entire process of brainstorming, writing, editing and proofreading the numerous essays required of the applicants. Seniors frequented the writing lab, located in the school library, throughout the first semester to work on application and scholarship essays, practice interviews and write letters, while underclassmen used the Center in the second semester for summer program applications, AP class essay writing practice and more. The positive results clearly speak for themselves! TASIS Dorado is a private, nonsectarian, coeducational school that has English as its language of instruction and is affiliated with The American School in Switzerland (TASIS) Schools in Europe. Located in the seaside town of Dorado, the modern campus sits on beautiful grounds surrounded by lakes and greenery. Highly qualified faculty are motivated to cultivate a love of learning in the 805 students in PPK through 12th grade. Excellent facilities including classrooms equipped with smartboards; a new STEAM Fab Lab outfitted with robots, 3D printers, laser cutters and more; and a state-of-the-art Performing Arts Center allow students to develop to their full potential. Headmaster Dr. Timothy Howard said, "We are so proud of these students for their remarkable accomplishments. They have high aspirations and go the extra mile to achieve their personal best and give back to the community in so many ways. Our team and the effort they put forth every day is what makes all this possible." For more information about TASIS Dorado, visit www.tasisdorado.com or call Admissions Director Jovita Casanova at 787-796-0440 Ext. 221 to schedule an appointment.